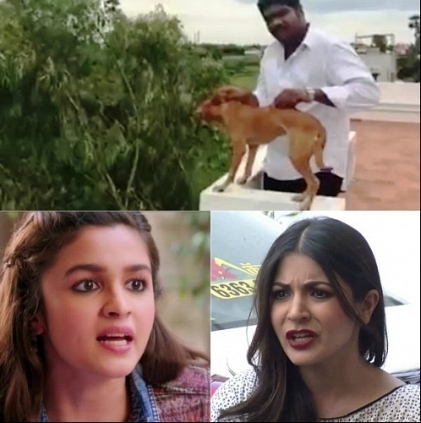 ALIA BHATT AND ANUSHKA SHARMA ENRAGED ! It has been a week since an outrageous video of two guys, identified later as medical students, throwing over a dog from the terrace surfaced. The offenders were tracked due to the efforts of social activists and the two turned themselves to the police and were arrested on July 7th. They were produced before a local court in Sriperumbudur and were allegedly let free after they paid the fine amount of Rs.50. The fact that such a heinous offence has been easily evaded has caused ripples across social media platforms. Now, Bollywood celebrities are taking a stand against this issue. “This is absolutely ridiculous!!!! I am appalled!!! !” tweeted an anguished Alia Bhatt, who also shared a petition to debar the two from the medical fraternity. Anushka Sharma has also reacted to the issue by tweeting “You can harm a voiceless puppy,pay a 50rs fine & be FREE of your crime! ?Is this the world you want children to witness & grow up in?" What connects Rajini, Kamal & Manikandan? People looking for online information on Alia Bhatt, Anushka sharma will find this news story useful. K Balachander - Velai, Drama, Cinema - Book Release Function.